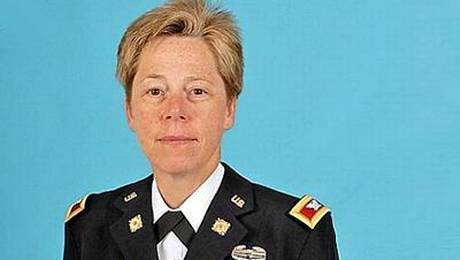 The United States Army has appointed its first-ever butch lesbian army general. The appointment follows the repeal of ‘Don’t Ask, Don’t Tell,’ which prohibited homosexuals from being open about their “sexual orientation” in the military. Tammy Smith, 49, was promoted to general status last Friday at a private ceremony at Arlington National Cemetery in Virginia. Her lesbian partner, homosexual activist Tracey Hepner, awarded her with one of the stars, and her father presented the other. “While we all enjoy this monumental moment, Tammy and Tracey are undoubtedly already wholly focused on their future and the next mission,” the site continues. Smith, who has served in the Army for 26 years, will now be stationed at the Army Reserve in Washington, D.C.
“Don’t Ask, Don’t Tell” was officially repealed in September of last year after it was overturned by both houses of Congress in 2010. One of the most prominent congressmen that voted for the repeal was Representative Ron Paul of Texas. “It isn’t the issue of homosexuality, it’s the concept and understanding of individual human rights,” Paul stated at a 2008 presidential debate when asked to outline his position on the matter. Since the repeal, a number of homosexual events have taken place on military bases, including a homosexual pride event at the Pentagon on June 26th, and a lesbian commitment ceremony in Louisiana last month. However, historic documents outline that homosexuality has been sharply proscribed in the military since the nation’s founding.